Rakha Bangdel is our oldest partner community, and is where the Deep Development model first began – even before dZi was officially registered in Nepal. When we started working here, it took days of walking from the nearest road head to reach Rakha but now it is connected with a rough road passing through its center. Now, we can reach Rakha from the capital Kathmandu after a 12 hours of grueling drive half of it through rough roads during dry season. There are 526 households with a total population of 3,125 people. The Kirat Nachhiring Rai indigenous community – the majority of Rakha’s inhabitants – is believed to have originated from here. The chief occupation of most people here is farming. In recent times, like elsewhere in Nepal, growing labor migration of youths have reduced farming activities drastically. Rakha is a very ethnically diverse community, and a variety of festivals are observed here. These range from the fifteen-day Sakela dance and Bhumi Puja – where the Nachhiring Rai worship nature and the Earth – to the traditional Hindu festivals of Deewali, Baalun, and Sangeni festivals. Many traditional practices for both Hindus and indigenous Rai groups have disappeared across Nepal, but are still actively practiced in Rakha. 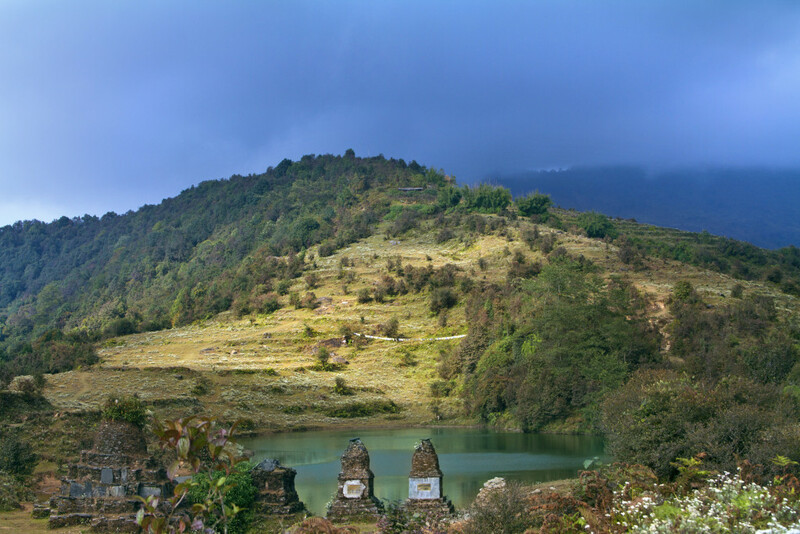 On a ridge perched high above the Rawa river, there is a small sacred lake called the Bahane Pokhari. Legend has it, this lake spontaneously formed only a few centuries ago. Every year, 3 festivals are held here – to mark the Nepali New Year and other important religious occasions. Nepal’s most famous, and first contemporary artist Lain Singh Bangdel’s ancestors come from Rakha. His last name ‘Bangdel’ is an homage to this village – made famous through his art and, later in life, his efforts to stop the trafficking of stolen artifacts from Nepal. With our local partner Creative Porters Society, the community and dZi foundation have partnered up to address many needs of the area including drinking water projects, school building construction and repair, agriculture program and formation of a cooperative.